EVGA welcomes you to the next generation of Intel Enthusiast performance: the X299 FTW-K! 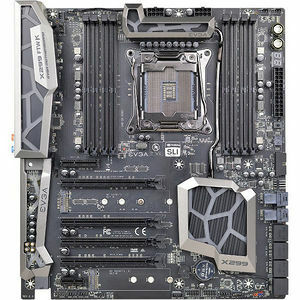 The X299 platform supports the newest Skylake-X and Kaby Lake-X processors. EVGA X299 motherboards further refine high-performance with multiple options for all the latest SSD options with support for U.2, M.2 and PCIe drives and is Intel® OptaneTM Memory Ready - a revolutionary higher-density memory interface, based on 3D XPoint Technology, delivers a new generation of SSDs designed to obliterate loading times for gamers. However, the X299 platform also supports all the features you've come to expect from EVGA, including up to 128GBs of Quad-Channel DDR4 at up to 4000MHz+ for Skylake-X, and 4133MHz+ for Kaby Lake-X (OC), Gigabit-NIC support, USB 3.0 and USB 3.1 Type-A and Type-C support, an updated UEFI\BIOS GUI, PWM fan control and a variety of SATA options to fit everyone's needs. The X299 FTW-K is built with a 8-layer PCB, featuring a CPU socket with 150% higher Gold content powered by an Advanced 14-phase Digital VRM, providing industry-leading stability for all your applications. Furthermore, this board is designed not ONLY for overclockers, but also for gamers with NVIDIA® 3-Way SLI without the need for PLX chips, blazing-fast networking featuring the Killer E2500 NIC and an Intel i219, Dual M.2 Key-M, Dual U.2, 8 SATA 3/6g and much more! Combining the best of current technology with the latest innovations, EVGA is further refining motherboard performance!